Hello and happy Wednesday! Just popping in to share some snapshots from my life lately. I started to decorate our house for fall, but realized my decorations are a little sparse. I think I went on a declutter spree a few months ago and may have donated more than I thought 😉 I’m liking the simplicity, though! Speaking of fall, I picked up this candle and this granola and give them both a 10 out of 10! The candle smells wonderful and the granola is the perfect blend of spices, oats, and white chocolate. I had some of the granola the other night mixed into in pumpkin yogurt with a cut up apple and it was fall on fall on fall! The cake I made for my mother-in-law’s birthday party went well! 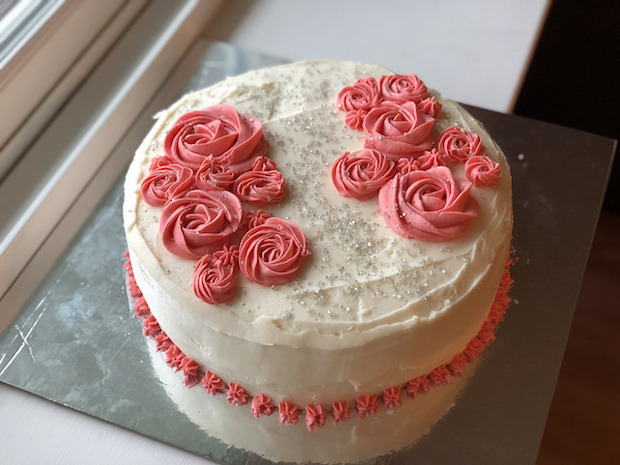 I ended up doing exactly what I thought I would (for once, haha): a strawberry cake with strawberry filling, vanilla buttercream, rosettes, and sprinkles. What was even better than the cake was the company that evening. 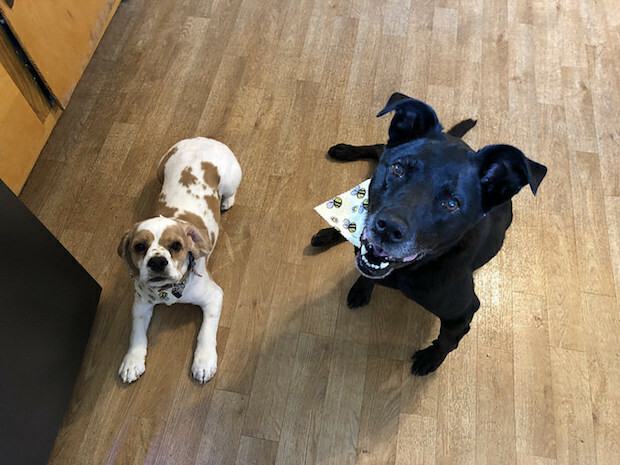 Mavis and my sister-in-law’s dog, Dixie! 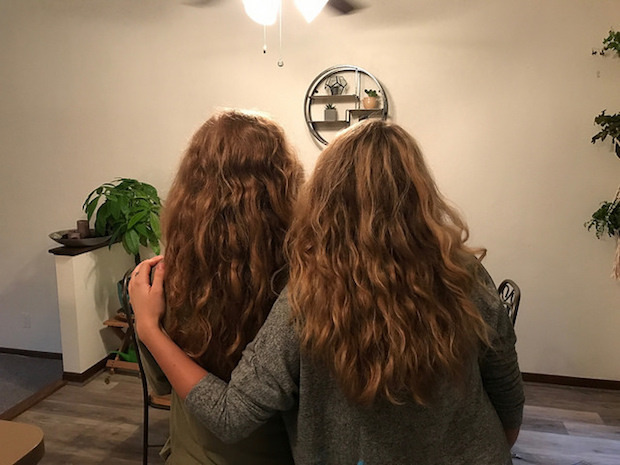 My sis-in-law and I were hair twins! Jimmy and I brought Mavis over to my sister-in-law’s house and we all had dinner and hung out celebrating my mother-in-law! It was a lovely evening and so fun watching Mavis interact with her “cousin” lol! 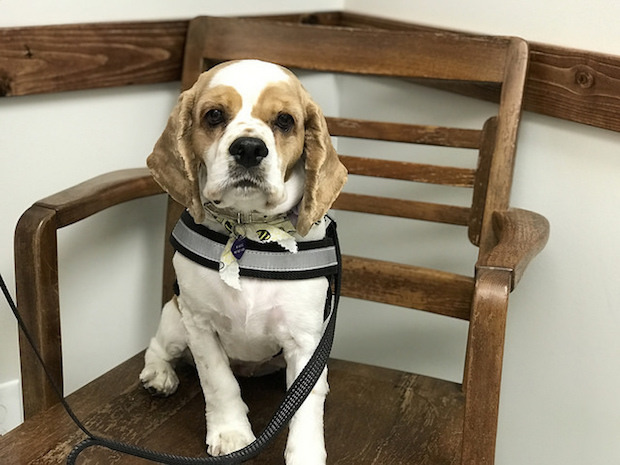 Mavis paid a visit to the vet over the weekend to get her yearly shots, plus a few extra shots so she can go to doggy daycare. I’m taking her for an interview at Camp Bow Wow today to see if she likes it. Jimmy and I figure it will be good to have doggy daycare as an option for our little energizer bunny to get her energy out from time to time once her little sister arrives! And rolling right into the topic of Mavis’ little sister, I’m happy to report that she and I had our last iron infusion! I can’t say enough good things about the doctors, nurses, and staff a the Hillman Cancer Center at Mercy Hospital here in Pittsburgh. I felt so well cared for and had great experiences each time baby and I went in for our infusions. 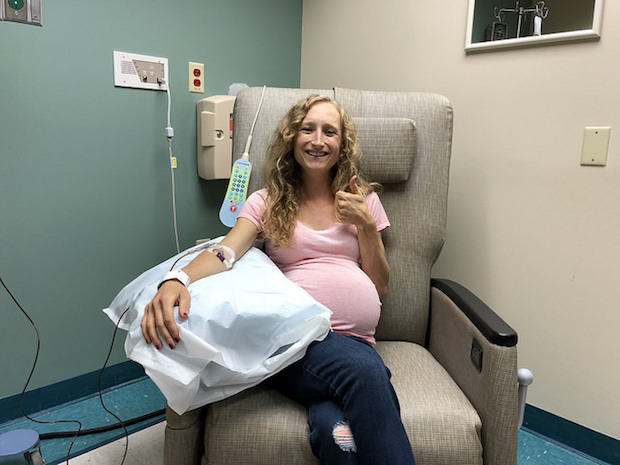 My hematologist (and pretty much everyone) was a little nervous baby and I wouldn’t make it to all four infusions before delivery, but by the grace of God we did! I’m still anemic, but my hemoglobin levels have risen, which is such a huge blessing! I’ll head back to the hospital in November for more blood work and infusions as needed. Okay, two more snapshots because I love sharing pictures of our pets! 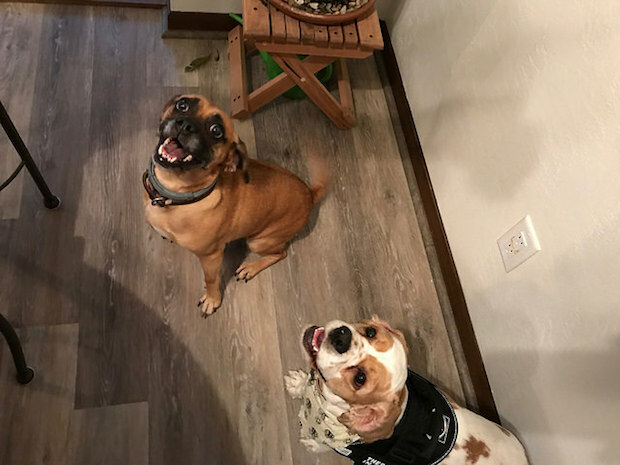 Lola and Mavis went to the groomer and got matching bandanas and Malcolm decided to camp out on our blanket and look adorably handsome. What would a snapshot of your life lately look like? Eeee, I am soooooo excited to start decorating for fall!!!! 🙂 I picked up a few things from Target and pumpkins as well, but – like you – I’m going minimal. (I have to with Brady in the house). 😉 BUT I do want to add a few more things, and I can’t wait to pick up a fall candle. This is my absolutely favorite season, so I’m excited!! 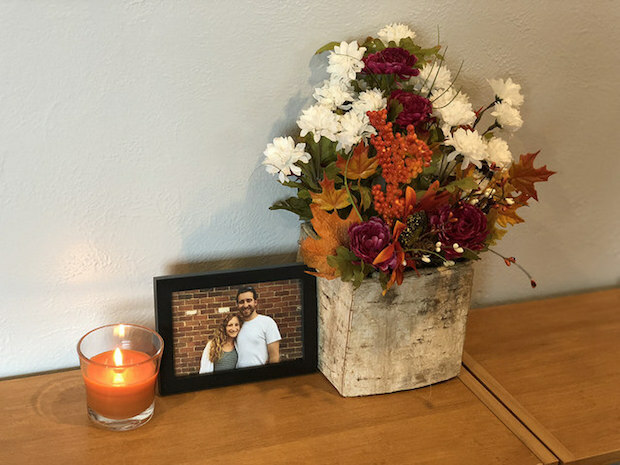 I’m glad I’m not the only one taking the minimal route with fall decorating! I hope you get an awesome fall scented candle! Something about candles just really make a room cozy! I totally remember you being anemic with your pregnancies! You know how it is! I’m excited to start feeling more energy again soon once the infusions fully kick in 🙂 like you said, it’s worth it! That cake looks so good! Mavis is super cute too… I think doggie day care is a good idea as you guys adjust to life with a new baby. I’m glad your iron levels are going up and you finished the infusions, too. Thank you, Amy! I had fun getting in the baking zone again! We are definitely hoping doggy daycare helps Mavis get her energy out if we can’t walk her as much! We’re so glad the infusions are done, too! I hope you stay safe during Florence! I’ve been thinking of you! Sometimes less is more decorations and it looks like a million bucks! Doggie day is always good to have in your back pocket. Another option would be a long leash (or rope) and tying Mavis to a tree or something in the backyard. We did it with Bailey at my parents house since they don’t have a fence and it worked super well! She could run around and fetch without worrying she’d run away. So glad you made it through all the infusions before baby arrived! So true about decorations! Our house is small, so less is more for sure! Love the tie out idea for pups! I’m glad we made it through the iron infusions, too! I think I’d be really tired if I hadn’t have gotten through them all! Hooray for making it through all four infusions! You are a champ! 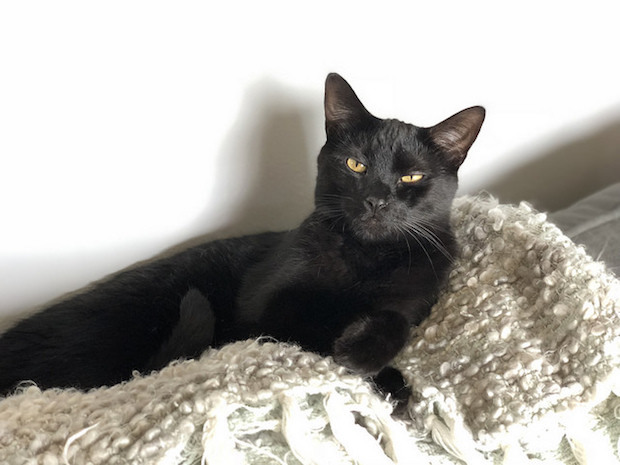 I’m so glad to hear that your levels have risen. What an answer to prayer! Having a doggie day care for Mavis to go to now and then once her sister arrives is a great idea! I hope she liked it! It truly was such an answer to prayer to be able to have the infusions and make it through them with minimal side effects and to get Sadie here healthy and safely! God is GOOD! I was sad to let go of summer, too! I’ve loved watching your videos of putting up Christmas decor lately! It makes me super happy and excited for this special season! Whoop whoop! I need to check out the IG you made! Yay for getting creative and enjoying the whole process! Want a piece of that cake sounded so good! Thanks for sharing all ALlie! I’ve wondered about those Glade candles. I’ll have to pick one up soon! I LOVE that pumpkin spice granola . So yummy. Yay! So happy you are done with your iron infusions. Woohoo! Almost there!! 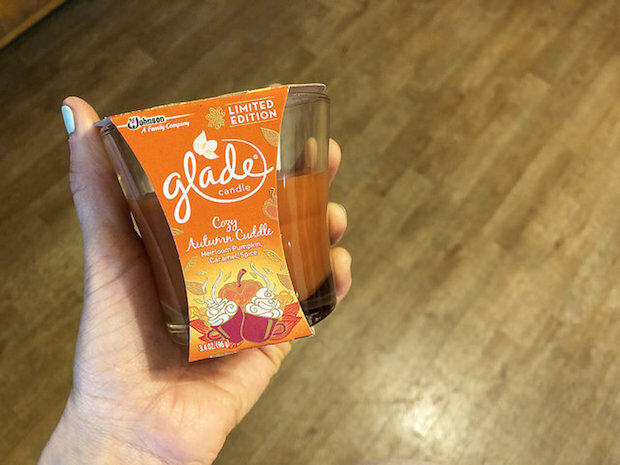 The Glade candles totally surprised me with how strong (in a good way) they are for the price!! 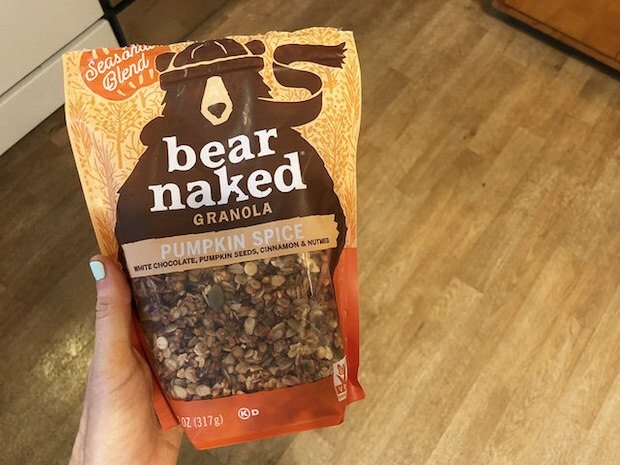 I love Bear Naked Granola! 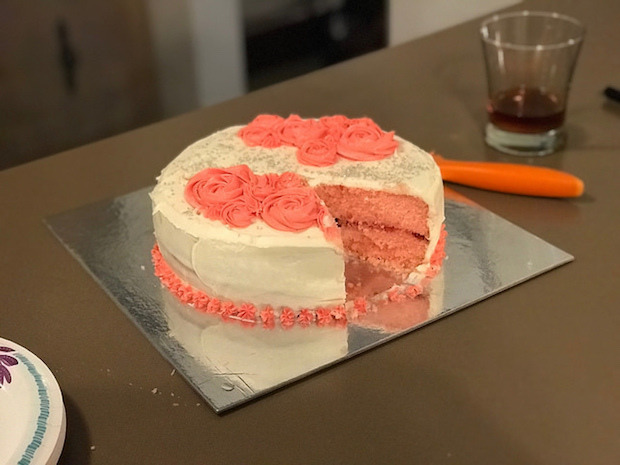 The cake you made is sooo beautiful and your pets are all so stinkin’ cute! Woo hoo! So glad we made it through those during the pregnancy! I hope it’s cooler and more fall-like in Cali now! I will have to check out that candle! We have a Walmart just minutes from us (totally dangerous for my wallet, haha) and I always wondered if their brand of candles were good! Some of their candle brands don’t have much of a scent after awhile of being lit, which is why the pumpkin spice was so amazing to me! It stays strong the whole time. I hope you love it if you try it!